Safely keep your dogs where they belong with Eyenimal’s containment fence systems! Our leading electronic pet fences are suitable for small and large yards as well as open spaces up to 875 yards/800m in diameter. These electronic fences provide warning beeps as your pets approach providing flexible spaces for your dogs to roam, that you define. Because dogs vary in temperament, size, and personality, each of your dogs can be fit with a collar with a stimulation setting that you define (note that beeps only sounds in operating mode). To determine the correct size door simply measure the width (A) and height (B) of your pet. 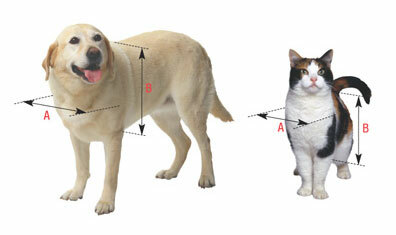 (B) Measure from the top of your pets back (just behind his head) to the bottom of chest. Click the button below to add the Deluxe Ground+ Fence - Eyenimal by Ideal Pet Products - FREE SHIPPING! to your wish list.